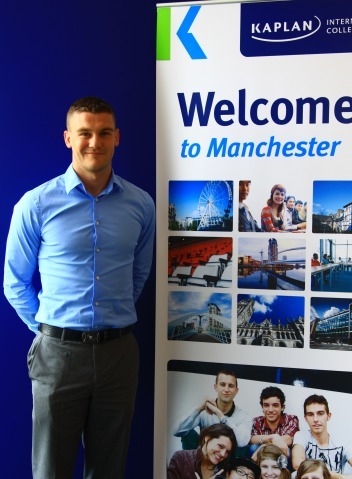 Kaplan International Colleges has appointed a former England football captain as the new Social Programme Manager at their language school in Manchester. member of the Liverpool FC academy from age 12 - 18 and captained the England youth football team at under-16 and 17 level. The 24-year-old has a degree in Science and Football Studies from Liverpool John Moores University and this year earned a Masters' degree in Liberal Arts from Lenoir Rhyne University in Hickory, North Carolina, USA, where he studied on a two year football scholarship. Jordan has played with and against famous international players such as Theo Walcott, Micah Richards, Danny Welbeck, Tom Cleverley and Aaron Lennon at many of the world's most prestigious stadiums like Old Trafford, San Siro and Hampden Park. Jordan said: "I think my footballing experience will help me be a great team member here at Kaplan and being a captain also makes you a very outgoing person with good communication skills, which you need to be in my role a social programme manager. "In football to be successful you have to be self-motivated and motivate those around you and I think I can transfer that motivation to the students to engage them fully in our social programme." Students who choose to learn English at the Manchester language school enjoy a wide range of activities that help them to make lifelong friends and have a great time, which is a fundamental part of the Kaplan Experience. Some examples of social activities around include trips to art galleries, reggae nights out, curry nights, museum trips and much more. Aurelian Popescu, Principal at Kaplan International Colleges Manchester, said: "We are looking forward to Jordan making a positive contribution to the Social Programme at Manchester and adding to our team's effort to create a memorable study experience for our students."